Newly Renovated! Share The Excitement! The Columbus Marriott Northwest has completed a renovation of all guest rooms, to include 49 inch SMART televisions and mini-fridges. Located in Dublin, an upscale suburb of Columbus, Ohio, our hotel is near Muirfield Village Golf Club, Columbus Zoo, and Tuttle Crossing Mall. 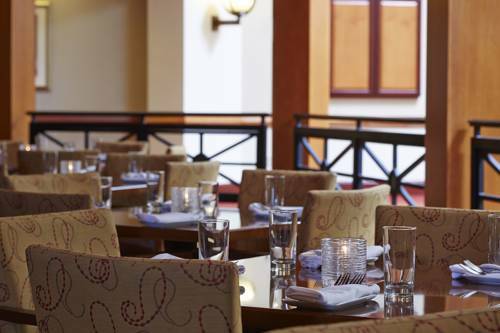 Our location is a ideal for families, groups and business travelers, as we are in walkable distance to many unique dining options and shopping. At the center of our hotel is the Marriott Greatroom; flexible seating and spaces with a contemporary style and design, a coffee bar proudly serving Starbucks coffee, and a chef-crafted menu of small plates and pours.The Columbus Marriott Northwest has over 19 meeting rooms and 14,000 square feet of flexible event space for wedding receptions and meetings. Two Brother Bar & Kitchen: Two Brother Bar & Kitchen features small plates with unique flavors that appeal to a wide array of tastes, perfect to enjoy with your favorite beverage. The menu also includes a variety of great steaks, fresh seafood, soups, salads, desserts, and more.